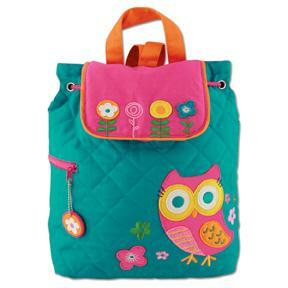 These backpacks make excellent gifts for baby showers, birthdays or any other special occasions! They are ideal for day care, dance class, pre-school, overnight bags or for use as small diaper bags. Approximately 11" tall x 13" wide by 4" deep. They have a drawstring with magnetic snap closure, a zippered side pocket with key ring. It has a carry strap handle on top as well shoulder straps. The length of the shoulder straps are adjustable using buttons and button holes. 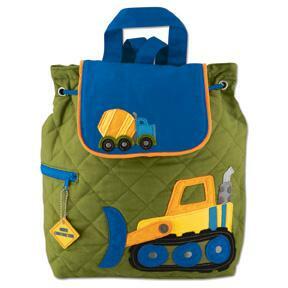 The 100% cotton quilted bags are fully lined and washable (cold water, hang dry). On the order form following the pictues below, select the bag, embroidery style and where you would prefer the embroidery, flap or bag. Depending on the style of bag or the length of the name, it may not be possible to use the flap, we will use the bag if necessary. Please Complete the Order Form details and click the "Add to Basket" button.